Engineering geology, problems related to exogenous geological processes currently evolving under natural and man-made conditions. Trzhtsinsky, Yu.B., Kozyreva, E.A., Mazaeva, O.A. & Khak, V.A. (2007). – Recent exogeodynamics in the southern Siberian region. – Institute of the Earth’s Crust SB RAS, Irkutsk, 155 pp. (in Russian). Laperdin, V.K., Kozyreva, E.A., Radziminovich, Ya.B. & Rybchenko, A.A. (2008). – Exogenous process in geological environment. Assessment of natural hazards. – Institute of the Earth’s Crust SB RAS – University of Silesia, Department of Earth Sciences, Irkutsk – Sosnowiec, 107 pp. (in Russian). Rahmonov, O., Rzetala, M.A., Rahmonov, M, Kozyreva, E., Jagus, A. & Rzetala, M. (2011). – The formation of soil chemistry and the development of fertility islands under plant canopies in sandy areas. – Research Journal of Chemistry and Environment, 15(2), 823-829. Khak, V.A. & Kozyreva, E.A. (2012). – Changes of geological environment under the influence of anthropogenesis (by the example of south of East Siberia, Russia). – Zeitschrift für Geomorphologie, 56(2), 183-199. Levi, К.G., Kozyreva, Е.А., Zadonina, N.V., Chechelnitsky, V.V. & Gilyova, N.A. (2013). – Problems of induced seismicity and engineering geological protection of reservoirs of the Baikal-Angara cascade. – Geodynamics & Tectonophysics, 4(1), 13–36 (in Russian). Kadetova, A.V. & Kozyreva, E.A. (2013). – Potential natural hazards: planning and operation of the ropeway at the “Gora Sobolinaya” ski resort (Southern Cisbaikalia). – Geography and Natural Resources (Geografiya i prirodnye resursy), 1, 50-55 (in Russian). Mazaeva, O., Khak, V. & Kozyreva Е. (2013). – Model of erosion-landslide interaction in the context of the reservoir water level variations (East Siberia, Russia): factors, environment and mechanisms. – J. Earth System Science, 122(6), 1515-1533. Mazaeva, O.A., Khak, V.A. & Kozyreva, E.A. (2014). – Monitoring of local coastal geosystems of the Bratsk reservoir. – Geomorphology RAS (Geomorfologiya), 1, 75-80 (in Russian). Kozyreva, E.A., Pellinen, V.A., Mazaeva, O.A. & Khabidov, A.Sh. (2014). – Types of the Olkhon Island shores (the Baikal Lake). – Geomorphology RAS (Geomorfologiya), 3, 74-84 (in Russian). 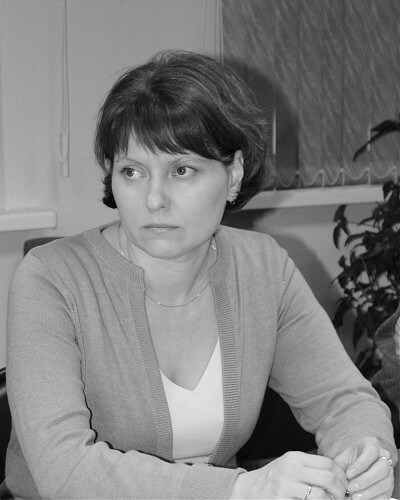 Svetlakov, A.A., Kozyreva, E.A. & Rybchenko, A.A. (2014). – Preliminary analysis of Olkhon Island grounds temperature (based on monitoring data). – Bulletin of Irkutsk State Technical University (Vestnik of Irkutsk State Technical University), 4, 81-84 (in Russian). Kozyreva, E.A. (2014). – Technogenesis influence on the geological environment: specific features of exogenous geological processes in the southern East Siberia. – Otechestvennaia geologiia, 4, 41-50 (in Russian). Alekseev, S.V. & Kozyreva, Е.А. (2014). – Geological medium and underground hydrosphere. – Geodynamics & Tectonophysics 5(1), 201–221, (in Russian). Tyszkowski, S., Kaczmarek, H., S?owi?ski, M., Kozyreva, E., Bryka?a, D., Rybchenko, A. & Babicheva, V. A. (2015). – Geology, permafrost, and lake level changes as factors initiating landslides on Olkhon Island (Lake Baikal, Siberia). – Landslides, 12(3), 573-583. Vasil’chuk, Yu.K., Alexeev, S.V., Arzhannikov, S.G., Alexeeva, L.P., Budsntseva, N.A., Chizhova, Yu.N., Arzhannikova, A.V., Vasil’chuk, A.K., Kozyreva, E.A., Rybchenko, A.A. & Svetlakov, A.A. (2015). – Isotope composition of lithalsa ice core in the Sentsa river valley, Eastern Sayan. – Earth Cryosphere (Kriosfera Zemli), XIX(2), 52-66 (in Russian). Kozyreva, E.A., Rybchenko, A.A., Khabidov, A.Sh. & Fedorova, E.A. (2015). – Exogenous geological processes in the coastal zone of the Krasnoyarsk reservoir. – Geography and Natural Resources (Geografiya i prirodnye resursy), 2, 83-91 (in Russian). Levi, K.G., Miroshnichenko, A.I., Kozyreva, E.A. & Kadetova, A.V. (2015). – Models of the evolution of lake basins in Eastern Siberia in the Late Pleistocene and Holocene. – Bulletin of Irkutsk State University (Izvestiya Irkutskogo gosudarstvennogo universiteta), 11, 36-65 (in Russian). Khimenkov, A.N., Vlasov, A.N., Sergeev, D.O., Kozyreva, E.A. & Pellinen, V.A. (2015). – The influence of cryogenic processes on steppe slopes in Pribaikalye. – Environmental Geoscience: Engineering Geology, Hydrogeology, Geocryology (Geoekologiya: Inzhenernaya Geologiya, Gidrogeologiya, Geokriologiya), 6, 535-543 (in Russian). Tyszkowski, S., Kaczmarek, H., S?owi?ski, M., Kozyreva, E., Bryka?a, D., Rybchenko, A. & Babicheva, V.A. (2015). – Ruchy masowe na obszarze wieloletniej zmarzliny wyspowej w dobie zmian klimatu (Olchon, wschodnia Syberia) (Mass movements in an isolated area of permafrost in the era of climate change (Olkhon, East Siberia). – Przegl?d Geograficzny, 87(3), 457-476.